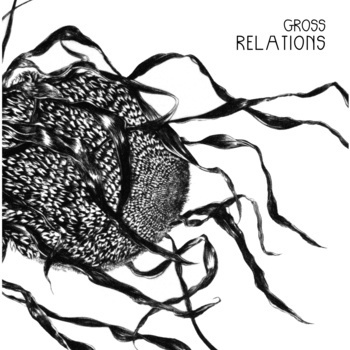 Heavily distorted and catchy as hell, don’t sleep on Brooklyn up-and-comers Gross Relations. This fearsome foursome is churning out some sick garage synth-pop that will get in your head and stay there. Their songs are a bit rough around the edges, yet undeniably infectious. It’s easy to see why they’re blowing up the blogosphere. They’ve drawn several comparisons to The Rentals, but these guys immediately reminded me of the early music of Seattle’s Say Hi. you’ll be singing its ambiguous chorus, “blame the records, not me,” with conviction before you know it. “Rewind You” features wailing Pixies-esque guitar.“Today Tomorrow” is frantic garage rock at its finest. On their brand new LP, Fuzzy Timelines, these dudes somehow manage to make “broken bones and a mutated spine” sound like the most fun you’ve ever had. The second track, “You Don’t Know Me” is simultaneously explosive and sweet, like watching fireworks while eating a popsicle. The timeline may be fuzzy, but the future looks bright for Brookyln’s Gross Relations.